As the College embarks upon a refurbishment programme, we’ve been delving into the historical uses of the rooms of our St Vincent Street building. The old Faculty Hall (now named Alexandra Room) was the venue for most of the College’s business until the new College Hall extension was built in 1893. In addition to Faculty meetings, and meetings of the Medico-Chirurgical Society of Glasgow, this room hosted the meetings of the Glasgow Pathological and Clinical Society from 1876. We were keen to explore what these meetings involved, who attended them, and the history of the Society itself. 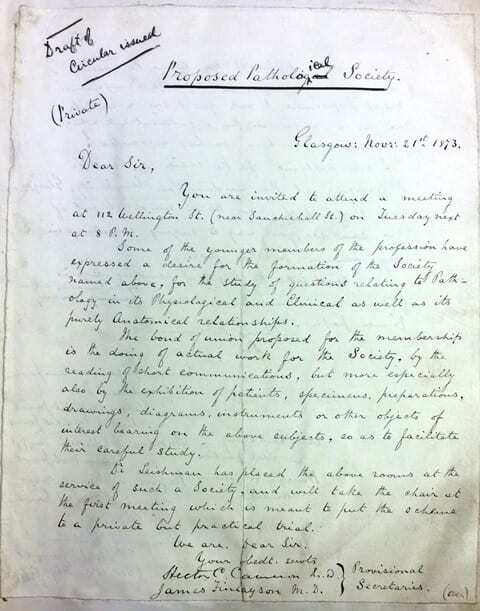 We are extremely fortunate to hold the archives of the Society, from its foundation in 1873 until its merger with the Medico-Chirurgical Society of Glasgow in 1907. 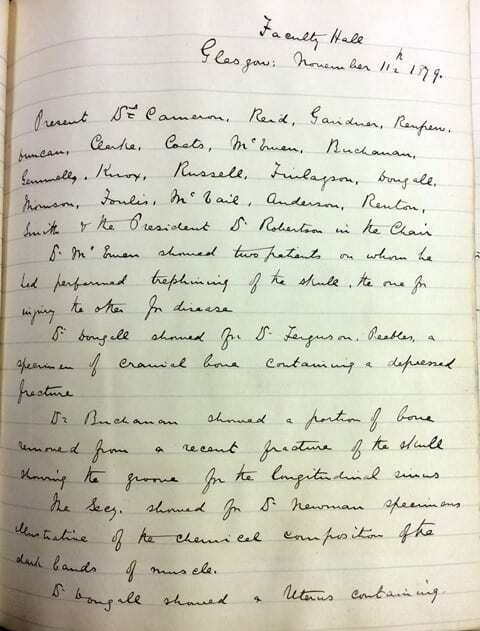 The first meeting was held on 25th November 1873 in the rooms of the University Lying-In Hospital and Dispensary for Women on Wellington Street. James Finlayson and Hector Cameron constituted themselves interim secretaries, while Dr Gairdner (then Professor of Medicine at the University of Glasgow) became chairman. In addition to those already mentioned, the original membership included the young surgeon William Macewen. From the first meeting, the format was established. The Agenda pictured above shows the list of specimens presented by the members for discussion. In further meetings, patients would also be presented. For example, in May 1874, Dr McCall Anderson showed a patient who had been treated for syphilitic paralysis. 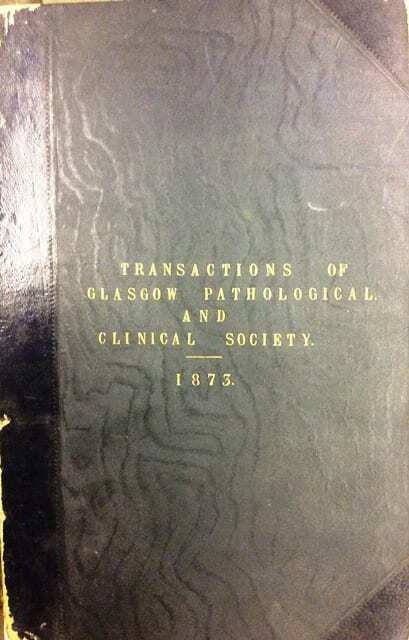 In 1874 the name was changed to the Glasgow Pathological and Clinical Society, and with the number of members increasing to 30, a new venue was found at the Glasgow Eye Infirmary on Berkeley Street. Then, in the fourth session, beginning in October 1876, the venue settled at the Faculty Hall, in the College’s current building on St Vincent Street. 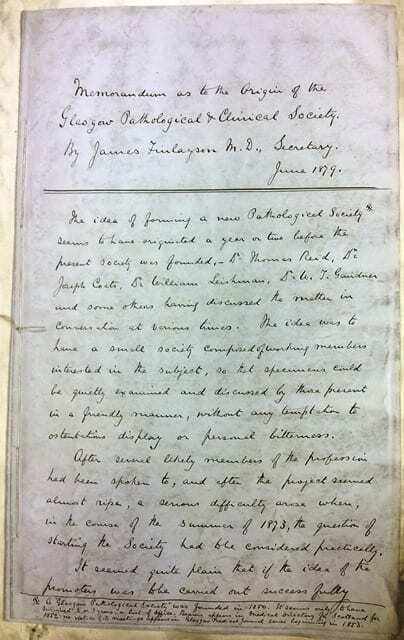 The origins and early history of the Society were usefully added to the book of Transactions (RCPSG 4/1/6) by James Finlayson in 1879 (below). 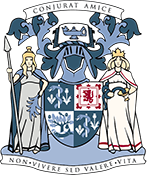 An important part of the Society’s business was the publication of its reports, in both the Glasgow Medical Journal and the British Medical Journal. This placed the research and practice of the Society in the context of the wider medical and surgical literature, which was at this time exploring many new areas and innovations. Notable in the records of the Society are cases concerning neurological conditions and physiology, the treatment of cranial injuries, and cranial surgery. For example, Glasgow physicians such as Alexander Robertson, who was pioneering in his approach to aphasia in the 1860s, and William James Fleming, who investigated the physiology of the ‘motions of the brain’, provide a stimulating context for the advances in brain surgery made by William Macewen in the 1870s. 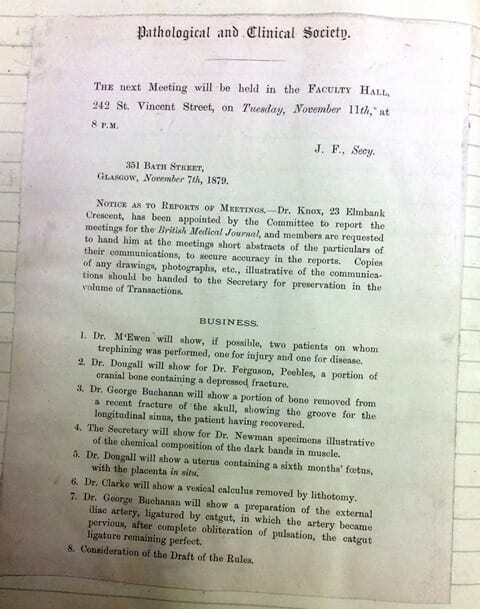 An exciting discovery in the Society’s Minute Book shows that on the 11th November 1879, Macewen presented to the meeting in the Faculty Hall “two patients on whom trephining was performed, one for injury and one for disease.” One of these patients was the fourteen year old girl upon whom Macewen had performed the first removal of a tumour from the dura mater (minute book detail below). 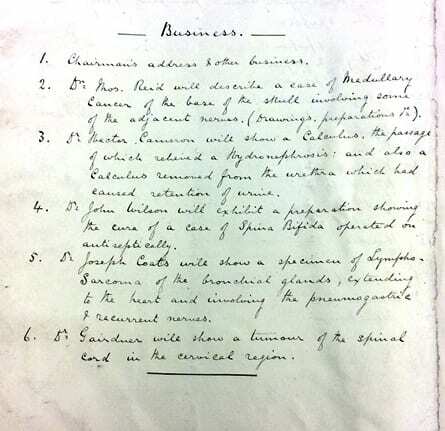 These records of the Glasgow Pathological and Clinical Society not only provide us with a wonderful source of evidence of the innovative research and practice in the city in the late 19th century, but also provide us with inspirational stories to tell in our College rooms.